The Polsky Center works in conjunction with University of Chicago alumni in various regions to manage the ANVC. The program is divided into three phases, which are outlined below. 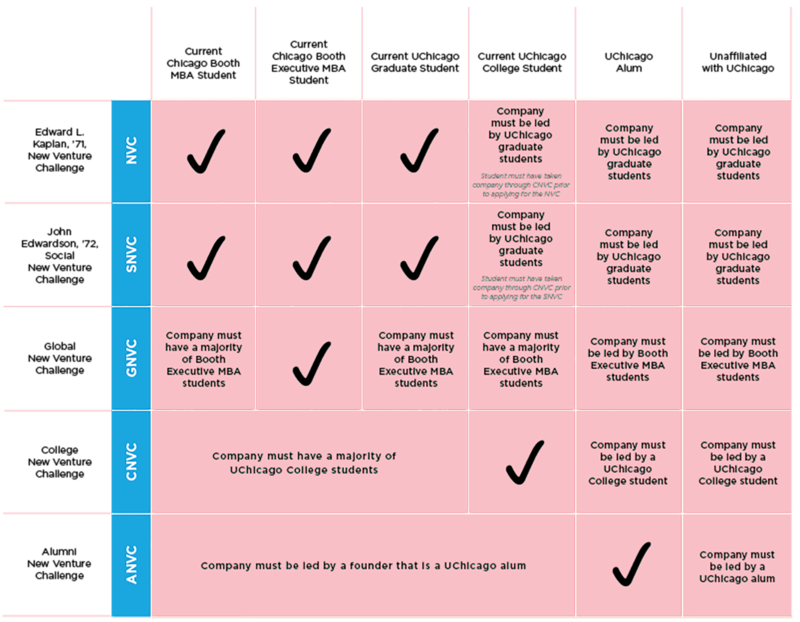 Phase I: Eligible University of Chicago alumni entrepreneurs will apply to the ANVC with a feasibility summary. The feasibility summary is the application for the ANVC. Applicants must choose one of the participating regions to apply to. Regional alumni leads will select 4-8 companies to advance to Phase II of the ANVC, with support from the Polsky Center team. Phase II: Accepted companies will participate in local programming, mentorship, and feedback opportunities (resources will vary by region). Phase II companies will receive access to virtual resources from the Polsky Center. Phase II will conclude with a regional semifinals event, where top team(s) from each participating region will be selected to advance as finalists to Phase III. Each region will send at least one finalist team, based on the number of applicants. Phase III: The program will culminate in Chicago during Chicago Booth Reconnect Weekend on Thursday, May 2, 2019, where finalist teams from each region will pitch in front of a world-class panel of investors and established entrepreneurs for a chance to win up to $100,000 in funding! Your team will need to create an account to submit the application. The application requires submission of basic details about the venture, an 8-page feasibility summary, team member resumes, and signatures from each team member to comply with the rules of the program. Good examples of feasibility summaries can be found on the Resources page and the Feasibility Workshop Webinar can be viewed online. If you have any questions about the application process, please send them to hannah.mannino@chicagobooth.edu.